Asparagus Frittata, Thyme for Cooking easy seasonal vegetable first course. Starters Beef Chicken, etc Fish Pork, Lamb Barbecue One Dish Salads Sides Misc. This makes enough for 4. We have the other half, cold, for lunch the next day. 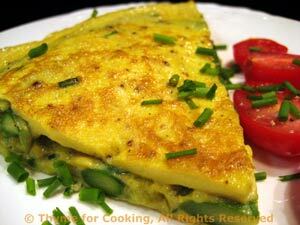 If you prefer not to have the leftovers, use half the ingredients, and make 2 traditional, fold-over omelets. In Spain, this would be eaten as a tapa or in a baguette as a sandwich. Snap off bottom ends of asparagus. Cut into 1" (2.5cm) pieces. Bring a medium saucepan half full of water to a boil. Blanch the asparagus for 3 minutes. Drain and plunge into a bowl of cold water. Drain again and lay out on paper towels to dry. Finely chop onion; mince garlic. Whisk eggs, cheese and chives together. In medium nonstick skillet (8". 20cm) heat 1 tbs oil. Add onions and garlic and sauté until tender, about 7 minutes. When onions are ready, add the blanched asparagus and heat through, stirring. Add the onion/asparagus mixture to the eggs and mix well. Put the skillet back on medium heat with remaining tbs of oil. Add egg mixture. Cook until eggs are cooked through, 6 - 8 minutes. If necessary, cover for 2 - 3 minutes, to set the top. When eggs are cooked through you need to turn it: slide it carefully onto a plate, put another plate on top and turn it over. Now slide it back into the pan to brown the other side, another 1 - 2 minutes. Slide it carefully onto a plate. Cut in quarters. Put one quarter on each serving plate, garnish with more chives and halved cherry tomatoes. Serve. Need help planning dinner? Do you have a garden? A CSA for fresh veggies? Try our Weekly Menu Plans: Healthy Gourmet Dinners; Quick, Easy Recipes. Each week carefully planned to reduce waste and use a lots of fresh, seasonal veggies.